Hair Club encourages anyone with hair loss to come to their local Hair Club location for a Free Hair Analysis. Hair Club (http://www.HairClub.com), North America’s largest provider of all proven hair restoration solutions, wants to inform and educate men and women suffering from hair loss about the solutions available to them. With August being National Hair Loss Awareness Month, there is no better time to understand the effects of hair loss and how to treat it. Hair Club encourages anyone with hair loss to come to their local Hair Club center for a Free Hair Analysis. There are over 80 million men in women in the United States affected by hair loss. 100% of those people can get their hair back with Hair Club. Unlike one-size-fits all drug store products, Hair Club’s hair loss solutions are designed especially for people experiencing hair loss and thinning at all different stages, with all different hair types. That means Hair Club can help anyone get their hair back. And Hair Club has thousands of satisfied clients to prove it. It's important to understand, especially during Hair Loss Awareness Month, that hair loss is progressive. That means it won’t get better on its own, it will only get worse without treatment. 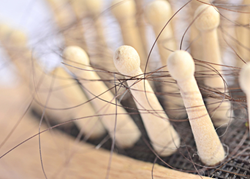 It’s no wonder American consumers spend over $3.5 billion per year on hair loss treatments. However, as many have come to realize, most just don’t work. Hair Club offers several different proven hair loss solutions for all hair types and levels of hair loss including Non-Surgical, Surgical and Product options. All of Hair Club’s hair loss treatments are proven effective and backed with extensive scientific research and cutting-edge technology. For more information on Hair Club’s solutions or to schedule a Free Hair Analysis, visit HairClub.com or call 888-632-8334. Founded in 1976 by Sy Sperling, Hair Club is the leading provider of all proven hair restoration solutions FDA-approved or cleared to work for hair loss. Hair Club has granted more than 500,000 men, women, and children an experience that truly changed their lives. Today, Hair Club has over 100 locations throughout the United States, Canada, and Puerto Rico and is a wholly owned subsidiary of Tokyo-based Aderans Co. Ltd, the world’s leading provider of total hair loss solutions. Aderans brands in the U.S. include Bosley. Hair Club for Men, Inc., ltd.